I LOVE popsicle sticks. 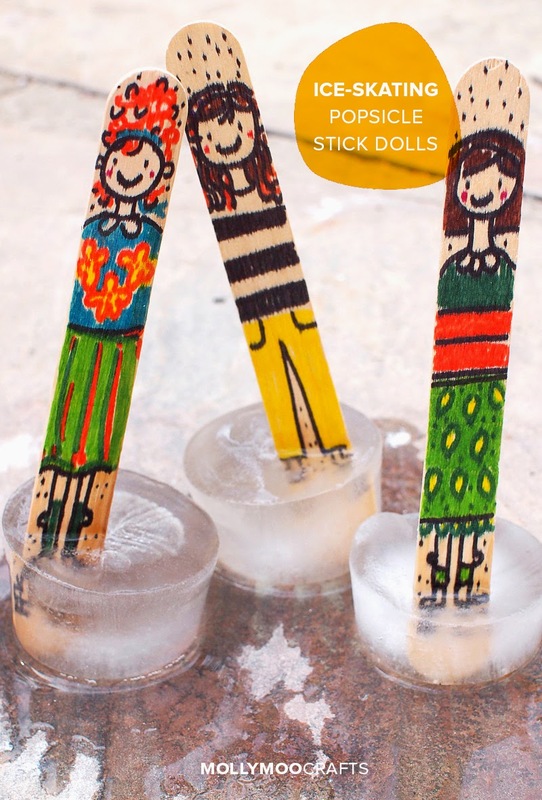 Today I'm over at MollyMoo sharing these easy-to-make and adorable ice-skating popsicle stick dolls! I love making beautiful things with kids. But I'll be honest with ya. Often times making beautiful things takes time to plan and prep... and I just don't have the energy. Often times I'll find myself at 11pm at night thinking, "Now shoot. What craft are we going to do tomorrow?" That's when I resort to fast and easy no-prep activities for the kiddos. And that's how these 3 "Going on a Bear Hunt" themed activities came about. 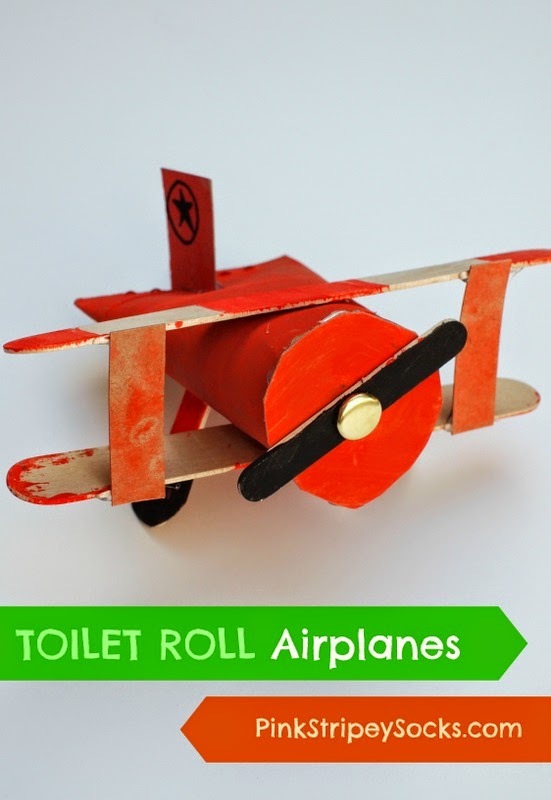 Chuck and I love reading the book, so I came up with 3 really easy crafts to go along with the bear hunt theme. Ready to go on a bear hunt with us? Ok. Let's start crafting! Currently, one of Chuck's favorite books is 10 Little Fish by Audrey and Bruce Wood. It's a cute book about subtraction. Kids count colorful fish on each page as they leave one by one. And (my favorite part), it has a fishy romance at the end (What can I say? I'm a closet romantic... tee heee hee.) 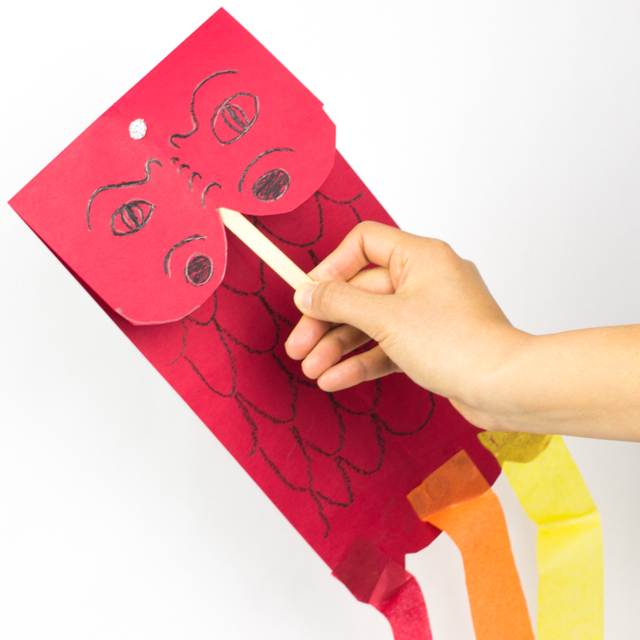 To accompany his love for fish, we recently made this DIY Magnetic Fishing Game. 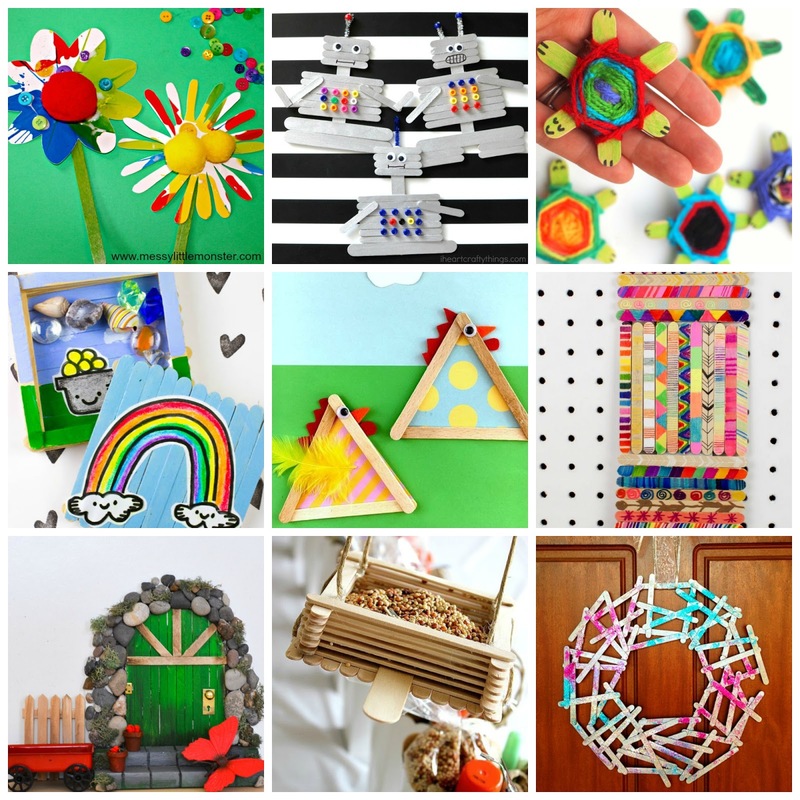 It's cute and colorful and really fun to make and easy to play. Want to make your own fishing game? Keep reading to see how we made ours! I'm not sure when it happened... but Chuck went from being a "sparkly-pink-bracelet" wearing boy to being a "rough-and-tumble-loves-cars-and-trucks" kind of boy. *Note: Some people just use Elmers glue. I had a ton of Sparkle Mod Podge, so I just used that. That's why they came out rather.... sparkly.... Next time I'll just use normal Mod Podge. 2. Figure out how many Popsicle sticks your image will need. Then, line up your sticks against something straight. Tape the sticks together so that they'll stay together for step 3. 3. Turn your sticks over so that the taped side is on the bottom. If you'd like, label the sticks with numbers. 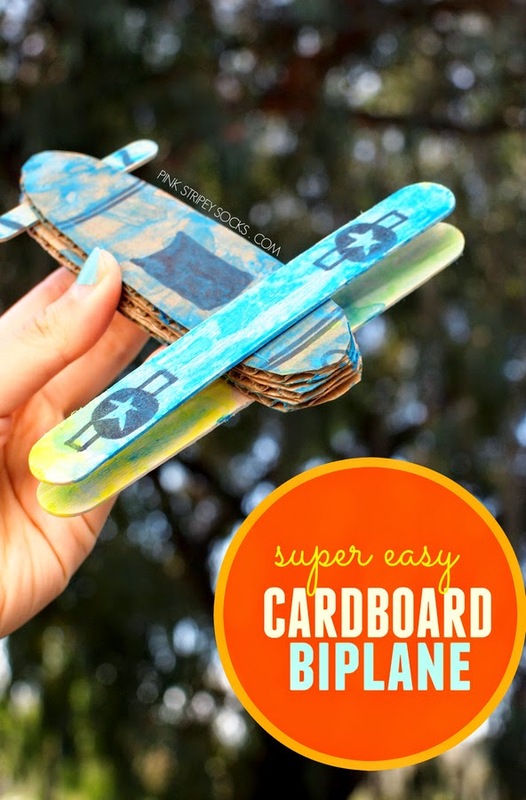 Use Mod Podge to glue your images onto the non-taped side of your Popsicle sticks. 6. Optional: To make a double-sided puzzle, tape the sticks together again, Mod Podge another image on the backs of your puzzle, and then cut the sticks apart again. 7. Use packing tape to label sandwich bags with the images. This will make clean-up easier and help the user to put together the puzzle. Do you love dominos? With the daylight hours getting shorter, sometimes Chuck and I find ourselves twiddling our thumbs, wondering what to do to pass the time. Lately I've been making him new playthings out of random stuff that's lying around the apartment. 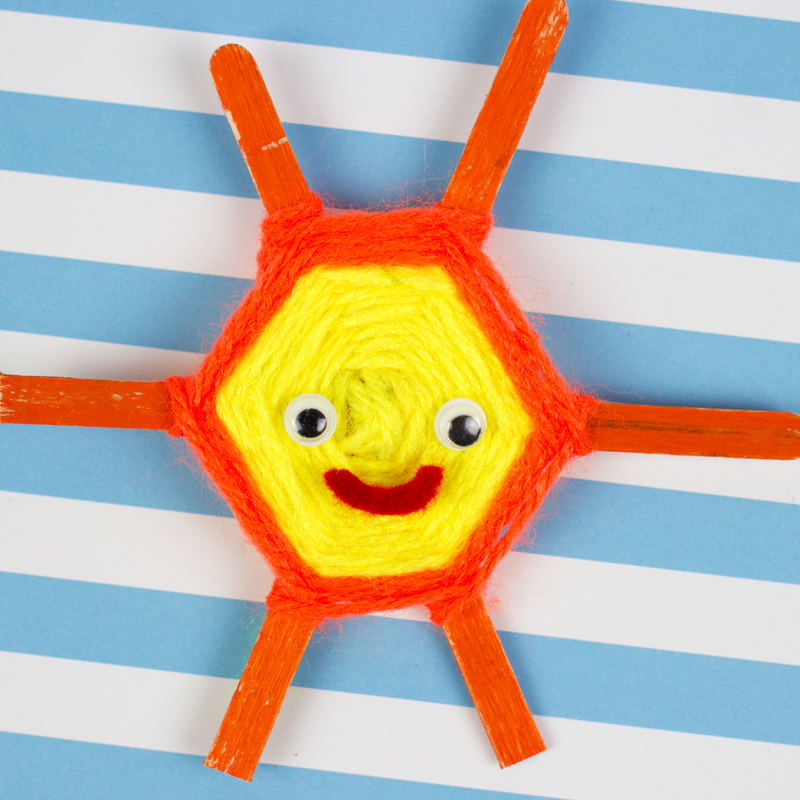 Here's one super easy toy that was made using mini craft sticks and Sharpie markers. 1. Cover your work area with a piece of scrap paper so the Sharpie markers won't stain it. 3. Place your sticks in a plastic bag until you're ready to play! To make it easier for my 2 year old, I first placed the sticks in rows, colored sides up. I wanted him to be able to see all of his choices as we played. Once I explained the game, I had to do quite a bit of prompting to get him to find matching colors. Overall, our game lasted a couple of minutes... and then he ended up using the sticks to make a house for... you guessed it, one of his beloved cars. Note: This is a post sponsored by Plaid, but the opinions are 100% mine. Halloween is finally out of my mind and I'm now looking forward to the next set of holidays. Even though I don't really like winter (boo, shortened daylight hours), I do appreciate that we're entering a special season filled with cozy sweaters, yummy food, family get-togethers, yummy food, twinkly lights, yummy food and of course... holiday crafting (and yummy food)! Right now I've got an itch to add more glitter and sparkle to my life. Luckily for me, Plaid sent me a couple of holiday-themed crafting items, including Mod Podge Sparkle, which will help me to do just that. Mod Podge is an excellent all-in-one glue, sealer, and finish. It's available in a ton of different formulas, making it a perfect to use for your holiday (or everyday) gift giving projects. So, inspired by the upcoming holiday season and my love of the nighttime sky, I made this sparkly, ombre, popsicle stick star garland. Wanna make this simple and sparkly garland? Well, put on your favorite holiday song and let's get started! 1. Decide how many stars you want to make. Then, take that number and multiply it by 5 to figure out how many craft sticks to paint. (Each star will be made out of five craft sticks.) Now it's time to paint. To create an ombre effect, first paint five stars your darkest color. (Be sure to paint the sides of your sticks too!) Then, add a bit of white paint to your original color to lighten it just a bit. Paint five more sticks with this lighter color. Keep repeating this procedure and mixing in white paint as you paint each new set of five sticks. Your original color will become lighter and lighter, creating an ombre effect. 3. Once your sticks are dry, it's time to make your stars! (If you have a bit of excess Mod Podge around the edges, use your scissors to trim it off.) To make sure that your stars look similar, first make a practice star and then use a pencil to trace your star's five points. Use these pencil marks as guidelines when you hot glue your stars together. 4. Arrange your stars in order. 5. Cut out your desired length of string. Then, tie your stars on one by one to the string, starting from your darkest color and ending with your lightest color. To make sure that the stars don't slide off, tie your string through the center of each star and not through one of the arms. 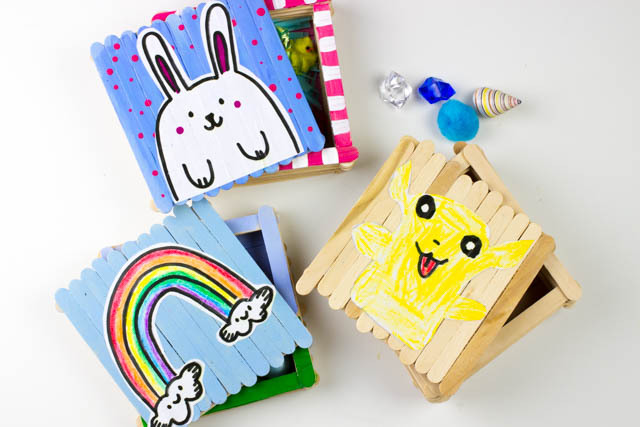 If you'd like to learn more about Plaid Products, you can always connect with them on Facebook, check out their Paint Me Plaid Blog, or sign up for their Newsletter. When I saw Mama Miss's Washi tape Popsicle bracelets, I was completely smitten. Bracelets... made out of Popsicle sticks? Super neat-o. Count me in. So today I present my version of Popsicle bracelets. They were really fun to make and brought me back to my summer camp days.